At this point there are few races in the Set Up series I have not had the pleasure to compete in. After getting a flat and DNFing at Lake Norman I had two options. Option 1) Wait to race the last race in the series, Pinehust, crossing my fingers that nothing prevents me from finishing. Option 2) Drive to the one of the most popular beaches in NC with two of friends to compete in a race I have never done with a disproportionately long swim. After weighing the pros and cons for about 5 secs, I signed up for the Wilmington YMCA Sprint Triathlon. I have heard nothing but great things about the race but I had no idea this was one of the largest sprint triathlons in the southeast often selling out with 1,100 participants. This is a different kind of swim than the ones I have grown accustom. Instead of following a row of sighting buoys and turning right at each of two turning buoys, we were just to cut through the intercoastal waterway, point-to-point. Sadly I knew instantly the goggles I picked were the wrong choice as the green tint washed out the orange color of the buoys. I should have gone with my tried-and-true pair but it was still dark when I had to choose. No turning back, I lined up on the front and in the middle of the two docks. Matt Wisthoff was off to my left with a gaggle of groupies, Marty Gaal was quietly bobbing to my right, and Eric Lane was hiding somewhere behind me. Pro tip: Always know where the good swimmers are. When the gun went off there was a steady stream of swimmers to my left as well as to my right. I didn't have anyone near me until I was on a collision course with Marty. Marty crossed over to my left, another guy held tight to my right, and Matt . . . well Matt was no where to be seen. I followed the buoys away from the start but after the turn the sighting buoys were minimal. I could barely see the dancing orange man so I just hoped I was on course and not losing too much time. It was a long run from the swim exit to the bike racks. I saw Matt head out on the bike. He crushed me. It should not surprise me that I got crushed by Matt but it disappoints me nonetheless. He has lots of experience on this course and knew exactly what to expect, a definite advantage above and beyond being the area's fastest swimmer. When I finally got to my rack I struggled to get my helmet on but other than that it was uneventful. I am pretty psyched I ended up with a good bike split. I was riding pretty conservatively which is normal for me but I was extra conservative because of the rain. I pushed the bike as hard as I felt comfortable during the straightaways but I turned it down in the corners. I needed to finish this race. Finishing was my #1 priority so I slowed my roll coming into the corners and rode around all the standing water and pot holes. Due to the rain we were required to get off our bikes at the metal grate on the bridge going out of and back into transition. If you did not get off your bike and walk it across the bridge you were instantly DQ'ed. I have never competed in race where I had to get off the bike mid-course. Going out it was not a problem. I jumped onto the sidewalk with my bike and ran across. On the way back, the sidewalk was not an option so I jumped off my bike and started to run across the grates in my cleats. It got awkward really fast so I quit running and just walked across. Coming into transition was a little chaotic as people were just starting to hit the bike course. Luckily I hit the correct entrance and exit so I was out running in no time. And by "no time" I mean :55 which is actually a long time. One of my lanemates swam a 100 free in :55 this morning. Hmmmmm, now that I think about it I probably should work on improving my transition times a bit. This run was interesting. The top ten guys had already passed me so I was out on the course alone. There were times when I questioned if I was still on the course. A guy passed me and wondered the same thing, we laughed together for a moment before he took off and I just plugged along. The course itself was bustling with spectators which normally means you are on the course but they were walking towards the transition as I was running away from it. The majority of them did not acknowledge my existence, like I was out just out shopping . . . in the streets of Wrightsville Beach . . . in a speedo . . . and running shoes . . . like it was no big deal. Once I got to the little out and back portion of the run course I felt a lot less exposed. I got the see the race as it was breaking down for the men and I now knew I had a pretty decent lead on the next female in my wave. I was super surprised and super stoke to cross the finish line under 71 minutes. Looking at the results from years past the fastest time on that course took place in 2005, in 1:10:54. With the rain, my conserve bike effort, and the whole walking across the bridge thing, I did not think I had a chance to clear 71 minutes. Luckily the swim currents were in our favor this year! After the race I did something I have never done before. I went to Starbucks and ordered a PSL. Squiggy-Wiggly posted a rant on FB about it and I had to see what the fuss was about. I figured it was a good time to forgo the donut and celebrate with a hot drink containing 49 grams of sugar. My conclusion: Oh smack that is a sweet drink!! The flavor is nice but if I am going to consume that much sugar, it is going to be in the form of a donut. I had to add black coffee just to make my treat drinkable. Luckily my $5 coffee came with pearls of wisdom from the cashier who started to lecture me on how he would never let a woman pay for her coffee, drinks, food, etc and how any man worth my time would have the same opinion. He had me convinced until he started dropping words like jail time, probation, in-laws . . . 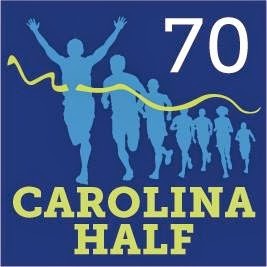 But now it is time to focus on yet another race, the Carolina Half. I have a little anxiety about my first half of the season but I am excited to finally get one under my belt this year. Wanna come watch? Consider volunteering for the Charlotte SPCA. If the CharlotteSPCA gets 60 volunteers at the race they will receive a donation of $1000!! There are still a few spots left. Click here for the schedule. Thanks to Leslie Thompson for all the sweet pictures and for picking fights with Ross Handy. I am glad someone is keeping that kid in line!